With the beginning of the fall semester upon us, I thought it’d be relevant to talk about the importance of a first impression, particularly when it comes to fraternity recruitment and more specifically, new student move-in day. Whether your chapter is helping with first-year move-in, participating in orientation, or hosting social events, new students are looking to you as a representation of Greek life on your campus. This a huge opportunity for your Greek community to put a good foot forward and show off the class and benefits that being a member of a Greek organization has to offer. 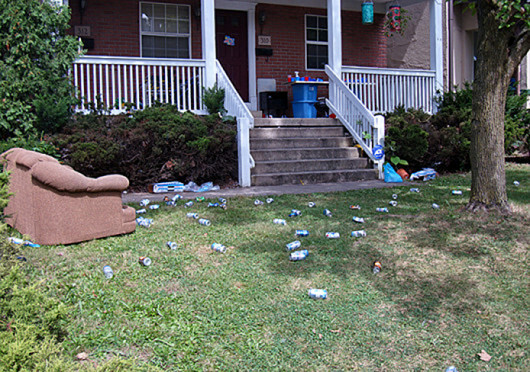 Unfortunately, this opportunity is often squandered, and instead, new students, as well as their parents, are welcomed with yards littered with empty beer cans, stupid banners, and day-drunk upperclassmen. Now don’t get me wrong, I understand that for many chapters, this is the first time since the previous semester that all of your brothers are together again. Syllabus week hasn’t even started, everyone’s excited to be back, and there’s not a lot to do but socialize. That doesn’t mean that you have to be obnoxious, though. Regardless, of the activities that you chose to partake in, there are respectful ways to do them, and idiotic ways to do them, and unfortunately all it takes is a few individuals to make everyone look like fools. …would a good idea. And realistically, that’s the problem, they just aren’t thinking. That or they’ve had a few too many drinks to think clearly, and the other guys in the chapter are just letting it happen. That brings me to my point. Undoubtedly, there are a number of students on your campus that are working hard to build a positive image of Greek life, and it’s very likely that it’s only a handful of students that are undoing all of their work. If you’re one of the bystanders in your chapter, you can and should do something. And if you don’t, more likely than not, someone else will do something for you, and chances are it won’t be good for you or your chapter. And if you’re in another chapter and you see the guys next door being idiots, you can and should do something as well, because their first impression impacts how people perceive you, and regardless of whether or not that’s fair or should be the case, that’s just the way it is, so do something about it.